Explanation: What does a black hole look like? To find out, radio telescopes from around the Earth coordinated observations of black holes with the largest known event horizons on the sky. Alone, black holes are just black, but these monster attractors are known to be surrounded by glowing gas. 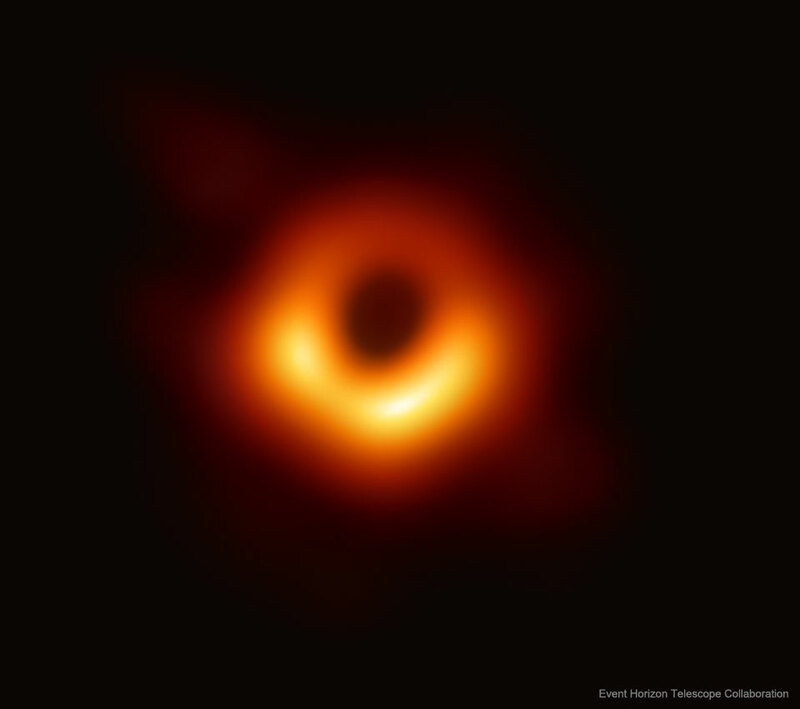 The first image was released yesterday and resolved the area around the black hole at the center of galaxy M87 on a scale below that expected for its event horizon. Pictured, the dark central region is not the event horizon, but rather the black hole’s shadow — the central region of emitting gas darkened by the central black hole’s gravity. The size and shape of the shadow is determined by bright gas near the event horizon, by strong gravitational lensing deflections, and by the black hole’s spin. In resolving this black hole’s shadow, the Event Horizon Telescope (EHT) bolstered evidence that Einstein’s gravity works even in extreme regions, and gave clear evidence that M87 has a central spinning black hole of about 6 billion solar masses. The EHT is not done — future observations will be geared toward even higher resolution, better tracking of variability, and exploring the immediate vicinity of the black hole in the center of our Milky Way Galaxy.